Last week during the castings for Oscar de la Renta, I had the opportunity to interview and photograph one of modelling's most exciting newcomers sixteen year old Kayley Chabot. 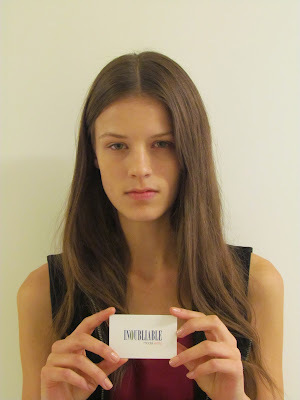 Hailing from Canada, Chabot was discovered three years ago at an open casting call by her mother agency Mode Models. In October of 2011, Paul Rowland of Ford Models Management spotted Chabot's star potential on the Mode Model Management website and signed her on the spot. Chabot possesses all the physical requirements suited to modelling; a lean willowy 180 cm frame, milky porcelain perfect skin, twinkling green eyes and a distinctive curled upper lip. Gorgeous looks aside, it is Chabot's charming and youthful exuberance which won me over within the first few minutes of our meeting. It appears that the fashion industry is in agreement, with Chabot scoring meticulously placed runway spots at Altuzarra, Alexander Wang, Calvin Klein, BCBG Max Azria, Jill Stuart and Proenza Schouler. Chabot lists Lara Stone and Abbey Lee Kershaw as her model inspirations and hopes one day to pose for model maker Steven Meisel. Chabot is certainly well positioned to continue her winning run in London, Milan and Paris, with her endearing personality and her enthusiasm.